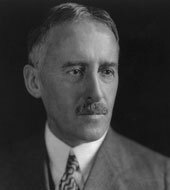 Henry Lewis Stimson served as Secretary of State in President Herbert Hoover's Cabinet from March 28, 1929, until March 4, 1933. Stimpson was born into a wealthy New York family on September 21, 1867. He attended Phillips Academy in Andover, Massachusetts, received his B.A. degree from Yale, and graduated from Harvard Law School in 1890. Stimson rose to prominence first as a partner in the legal firm run by Elihu Root, who served as Secretary of State and Secretary of War in the administration of Theodore Roosevelt. Stimson ran unsuccessfully as the Republican candidate for Governor of New York in 1910, but was then appointed Secretary of War by President William Howard Taft in 1911. He served in the U.S. Army during the First World War as a colonel in the artillery. Between 1918 and 1926, he served only as an occasional envoy to Latin America, mediating a dispute between Chile and Peru in 1925, and negotiating an end to the Nicaraguan civil war in 1927. President Calvin Coolidge appointed Stimson Governor General of the Philippines later that year, a post that he held until he was appointed Secretary of State in March of 1929. After President Hoover’s defeat in 1932, Stimson retired but was recalled to U.S. Government service by President Franklin Roosevelt, who appointed him Secretary of War in 1940. Instrumental in directing the atomic bomb program after 1943, he advised President Harry S. Truman to use it in 1945. He also helped develop plans for the trial of war criminals after World War II. He retired in September of 1945. Stimson succeeded Frank Kellogg as Secretary of State only a few days after the U.S. Senate had ratified the Kellogg-Briand Pact. He attempted during his tenure to save that pact, but commented in 1933 that "the situation in the world seemed to me like the unfolding of a great Greek tragedy, where we could see the march of events and know what ought to be done, but seemed to be powerless to prevent its marching to its grim conclusion." He headed the U.S. delegation to the London Naval Conference in 1930, which succeeded in limiting the naval race among the largest naval powers, although Japan would withdraw from the agreement in 1935. He also led the U.S. delegation to the Geneva Disarmament Conference in 1932. Upon Japan’s occupation of Manchuria in 1931, Stimson articulated what later became known as the "Stimson Doctrine," that the United States would recognize no diminution of U.S. treaty rights brought about by aggression. He also attempted, unsuccessfully, to limit the economic effects of war debts, but was thwarted by the U.S. Congress’ adoption of the Hawley-Smoot Tariff.